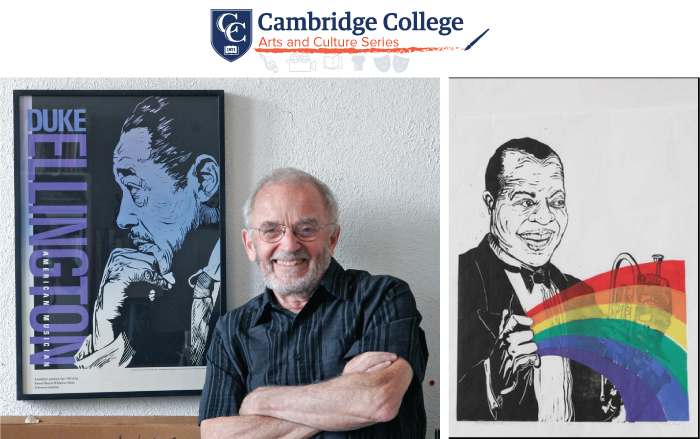 Cambridge College is proud to present the work of artist and senior instructor Peter Bodge as the first entry of the 2019 Arts and Culture Series. Peter’s work focuses on the many crucial contributions of African American musicians to American Jazz music and culture. In addition to galleries and public showings, Peter’s work has been featured in the Smithsonian Institute in Washington, D.C.
To learn more about the exhibit, download the event flyer. I cannot remember a time in my life when I was not drawing on something and when I wasn't listening to this great African American inspired art form—Jazz. And for the first half of my life, I attempted in vain to marry those two passions in a way that allowed them equal weight. Then, in 1977, I created an animated film based on the life of Charlie Parker, which was my most successful venture. But how to make the medium more accessible? It was then that I began printmaking and found that this was the approach for me: I could portray those Jazz musicians who have given me so much by a process that allowed multiple-image production that permits me to, "Pass It On" (as the great drummer "Papa" Jo Jones put it), to share my love of this music with everyone who will take the time to listen and to see. My great thanks to Cambridge College for granting you and me the opportunity to Listen to the Walls. See Photos from the Discussion!